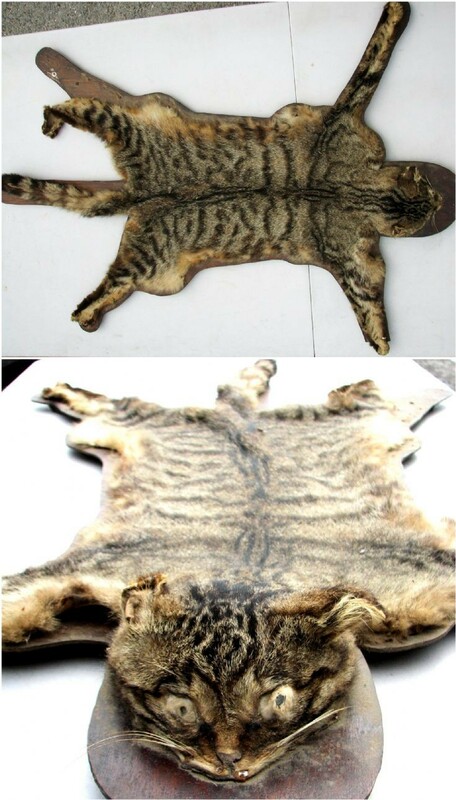 The above rather gruesome photographs are of the skin of a Wild Cat originally on display at Glenbuchat Lower Lodge. The Wild Cat is now a conserved species but this specimen will have been trapped or caught in Glenbuchat many years ago when they were much more common. They are still however found in the Glenbuchat area. Dave Hendry of Belnaglack, Glenbuchat, the owner of the skin, recalls about 30 years ago meeting a wildcat on his farm. The following article from Scottish National Heritage provides more information about the Wild Cat in Scotland. "The Scottish wildcat (Felis silvestris) is the only native member of the Felidae, the cat family, to be found in the wild in Britain. It is protected under the Wildlife and Countryside Act 1981, as amended, and is identified as a European Protected Species on the Conservation (Natural Habitats, &c.) Regulations 1994, as amended. In general, the Scottish wildcat prefers to live in the margins of mountains and moorlands with rough grazing, often combined with forests and some crops. However, research suggests that animals in the east of Scotland prefer marginal agricultural areas with moorlands, pastureland and woodlands, whereas animals in the west favour rough grazing and moorland with limited pastures. They avoid high mountain areas, exposed coasts and fertile lowlands with intensive agriculture. Formerly distributed across Europe, Asia and Africa, the species became extinct in Austria and the Netherlands in the first half of the 20th century. They are thought to have declined in the Czech and Slovack Republics and are confined to three major areas of the former Soviet Union: the Carpathian Mountains of the Ukraine, the Kodry region of Moldova and the Caucasus mountain region between the Black and Caspian seas. Elsewhere, in Europe, isolated populations are limited to the Iberian peninsula, Italy, north-east France-Luxembourg-Belgium, north-west Germany, eastern central Germany and the Balkans. The current UK status of the Scottish wildcat is unclear. A questionnaire survey in 1983-87 suggested that the species was restricted to an area north of the Central Belt. A subsequent survey based on live-trapping and road kill/carcass records in the 1990s suggested that the distribution was limited to the north-east of Scotland (primarily Perthshire, Angus, Grampian and the eastern Highlands), with a small residual population in Argyll and Lochaber. There are only two density estimates available for Scotland. These are Glen Tanar, Deeside with 30 wildcats per 100 km2 and Ardnamurchan with an estimated 8 wildcats per 100 km2. A 1995 study resulted in an estimate of 3,500 pre-breeding animals of independent age (over 5 months old) across Scotland. The wildcat began to decline in Britain in the early 1800s and was lost from England and Wales by 1862. The decline in Scotland continued into the 20th century and the range was confined to the north-east by the 1920s. There was a small expansion in range, considered to be a reflection of increased numbers, over the following 20 years and the range has been stable since the 1940s, despite suggestions that numbers were increasing." For further information on Wild Cats Click on the following. Glenbuchat -chat is French for cat-l was told that the name means Glen of the Wild Cat by my father who was born in Sunnybrae Farm 1880 right or wrong?